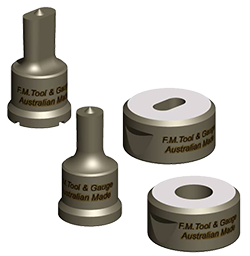 FM Tool & Gauge manufactures a wide range of punches, dies and shear blades for the Australian Metal Fabricating Industry. A large amount of punches and dies of varying sizes are held in stock. These are suitable for SCOTCHMAN, Kingsland, Geka, Sunrise, Peddinghaus and Mubea Machines. 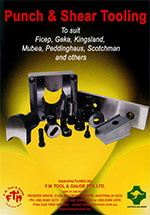 All other tooling types are non-stock and will be manufactured to order.